[Journal Club] Alzheimer’s disease & Zinc: the missing link? Alzheimer’s disease (AD) is one of the most serious diseases mankind is now facing as its social and economical impacts are increasing rapidly. 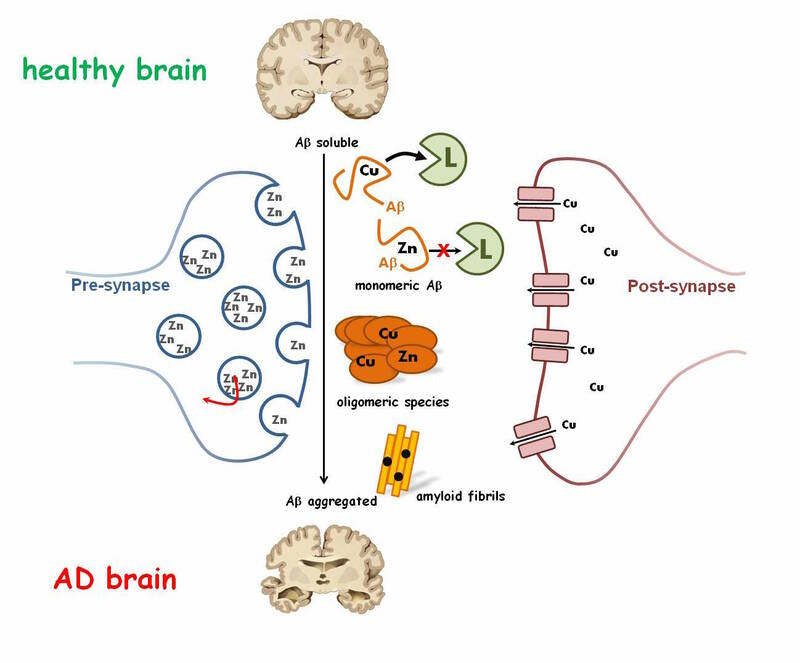 AD is very complex and the amyloid-β (Aβ) peptide as well as metallic ions (mainly copper and zinc) have been linked to its aetiology. While the deleterious impact of Cu is widely acknowledged, intervention of Zn is certain but still needs to be figured out. The aLzINK project recently funded by ERC (starting grant) lies in this context. This project is strongly anchored in the bio-inorganic chemistry field at interface with spectroscopy and biochemistry. It aims at designing, synthesizing and studying new drug candidates capable of (i) targeting Cu(II) bound to Aβ within the synaptic cleft, where Zn is co-localized and ultimately to develop Zn-driven Cu(II) removal from Aβ (approach 2) and (ii) disrupting the aberrant Cu(II)-Aβ interactions involved in Reactive Oxygen Species (ROS) production and Aβ aggregation, two deleterious events in AD. The drug candidates will thus have high Cu(II) over Zn selectively to preserve the crucial physiological role of Zn in the neurotransmission process. Zn is indeed always underestimated in current therapeutic approaches targeting Cu(II) despite the known interference of Zn with Cu(II) binding. To reach this objective, it is absolutely necessary to first understand the metal ions trafficking issues in presence of Aβ alone at a molecular level (i.e. without the drug candidates). This includes: (i) determination of Zn binding site to Aβ, impact on Aβ aggregation and cell toxicity, (ii) determination of the mutual influence of Zn and Cu to their coordination to Aβ, impact on Aβ aggregation, ROS production and cell toxicity. This will be the first part of the project while the second will be dedicated to the study of the drug candidates.